Daniel has directed Thalia’s productions of The Impossibility of Now, When Love Speaks, Sorry, A Lesson from Aloes, and A Day in the Death of Joe Egg. Daniel’s theatrical passions gyrate between the patricide, matricide and fratricide of Greek tragedy, and the sequins, songs and dancing boys of Broadway musicals. He’s delighted to fuse these schizoid halves building Thalia’s Umbrella. Daniel is the product of labor activist and educator parents who fell in love at a progressive youth summer camp and were devoted to unions, Puccini, Ella Fitzgerald and Fred Astaire. Daniel’s hero is the great American lyricist Yip Harburg, who proved that the best way to put across a socially conscious and enlightening message is to serve it up with humor. Daniel’s theatrical training and experience range from playing the conniving servant Mosca in his Turkish high school production of Ben Jonson’s Volpone in Istanbul, to directing more new play readings and workshops in New York City than there are taxis circling Times Square. The hilarity of his New York production of Moliere’s The Miser was praised by The New York Times, and that of his Seattle production of Yasmina Reza’s Life x Three by The Seattle Times. 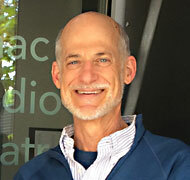 He has directed opera in Oregon, Alaska and here in Seattle at Cornish College of the Arts. He first met Terry when he cast him as the lead role of Alan Turing in Breaking The Code at the now-defunct Alice B. Theatre Company. He has an MFA in Directing from Carnegie-Mellon University, which means that somebody, somewhere, once thought he knew what he was doing.